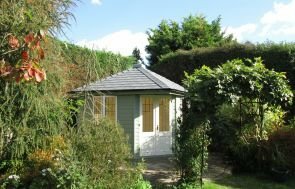 This attractive garden building is our Holkham Summerhouse, and it has been installed in our customer’s garden in Baldock, Hertfordshire to use as a 2.4 x 3.0m writing room, positioned to help draw inspiration from her lovely cottage garden. The leaded window style is the standard option with the Holkham, but this customer wants to allow as much natural light inside as possible, so they chose to have the plain windows. 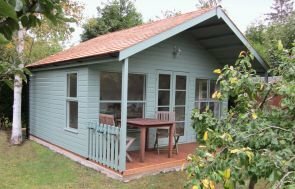 To keep the summerhouse comfortable to use through the whole of the year, the customer chose to have natural matchboard lining, full insulation, double glazing, and an electric pack. Externally, the colours the customer chose are very neutral, allowing the building to blend in with the garden, with grey slate effect tiles on the roof, and the paint colour is Ash from our Valtti Paint Range. 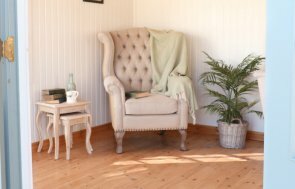 Polished brass door and window furniture offer a final touch of traditional style. 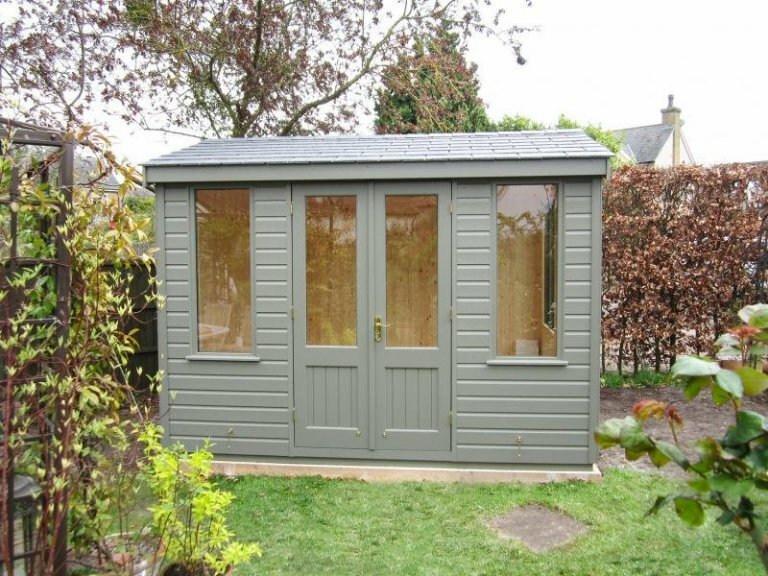 If you like the look of this Holkham, or you would like your own hobby room in your garden, please look at our full ranges of Summerhouses, Garden Studios and Garden Rooms to see the different design styles we can offer. For more information, please call us on 01760 444229, or contact us online, and our helpful team will be able to answer any questions you have.